I wanted to like this book much more than I did. It was another Amazon Prime special, not really available til February 1, and I loved the premise - a poor girl making good. She gets the guy and lives rich, and happily-ever-after, right? Well, that was her plan, anyway. 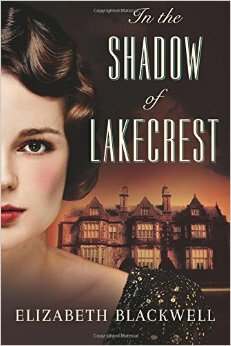 In the Shadow of Lakecrest by Elizabeth Blackwell fit the 14th category on the reading challenge list - a book involving travel. Kate is able to impress a very rich man aboard an ocean liner while acting as a governess for two girls. The girls' aunt warns her about the family and an old mystery, but rich is rich, and Kate figures the aunt is just a grumpy old biddy who must be jealous. If only she knew then, isn't that what they always say? Most of the book was quite an intriguing flashback, and I kept reading to find out how everything would unfurl. But then suddenly I found myself in the Epilogue, finding out how it all ends, with a child I knew nothing about, and no satisfying conclusion to the foreshadowing at the very beginning. I was happy with the ending, but I felt like I'd just found out about a high-school friend on Facebook. I knew where it all stood 20 years ago, and I got to the happy ending, but the middle was sort of missing. It may have made a good part one, maybe bring the other child in on a part two, and then work toward an ending? Just my two cents. What is your reading challenge this year? Maybe we can connect on Goodreads and keep each other accountable? This book looks interesting, but it would likely fall low on my list haha. That looks interesting. Will add this on my list.